New Delhi: UN Women, the United Nations entity dedicated to gender equality and the empowerment of women, and WaterAid India, an international not-for-profit determined to make clean water, decent toilets and good hygiene normal for everyone, everywhere within a generation, are supporting Run4Niine – the nationwide initiative to spread awareness on menstrual hygiene awareness this International Women’s Day. 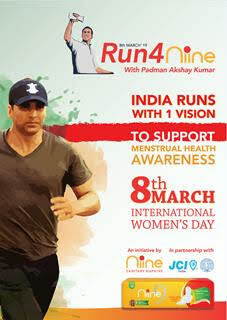 Megastar and the PAD MAN of India Akshay Kumar will be flagging-off Run4Niine, India’s largest nationwide run taking place in over 500 cities in over 20 states in India to end taboos around menstruation, from Lucknow, at 6:00am, Sahara Shaher on 8th March to mark International Women’s Day. An initiative by Niine Sanitary Napkins, the made-in-India affordable yet premium sanitary napkins brand, Run4Niine is supported by the Niine Movement which launched the nationwide #18to82 campaign movement to bridge the gap between the 18% of menstruating females in India who use sanitary napkins, and the 82% predominantly engaging in unhygienic and unsafe alternatives such as old cloths, rags, hay and even ash.